I read this book and kept going over it, gripped by the wealth of details, inside view and revealing information that I never knew about before. I read the book several times, found it to be motivating for action to bridge the deficit that is so well depicted in what the liberation struggle leaders did not accomplish for their people. The author Halle Jorn Hanssen, described the challenges that faced SPLM/A during the struggle, and later the deficits in their leaders political will that emerged, and which still persist to dash the aspirations for democracy development in South Sudan. I recommend the book as a valuable resource to build knowledge and gain appreciation of the context for critical challenges in the life of the new nation and needing to navigate towards democracy and peace building. 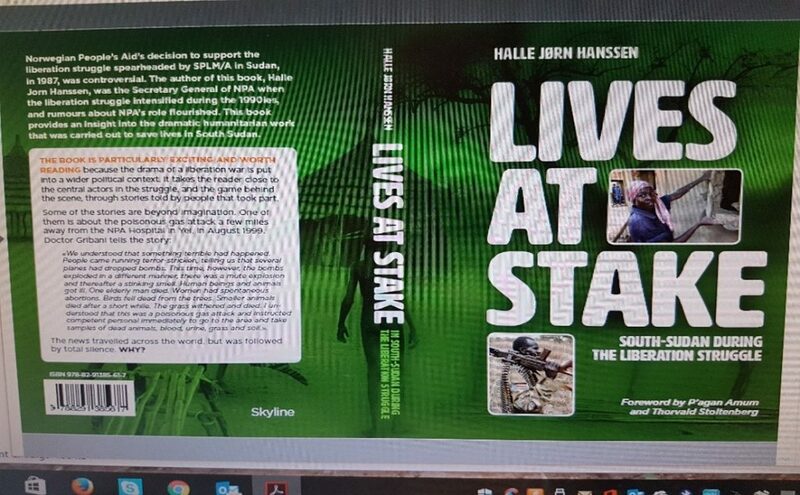 We are indebted to Halle Hanssen for sharing and recording something of the SPLM/A liberation struggle history in stories that shed light and increased knowledge of contemporary South Sudanese and future posterity of what went on during the liberation struggle. It clearly also said something about what still remains of the struggle for “new democracy, development and social justice in the newest state” on the continent.. Hanssen’s efforts to share his knowledge will not be in vain, as we all take stock and pick up the pieces to try stitch things that have fallen apart together again, to mend the broken social fabric in South Sudan, perhaps in the making of a new democratic social contract that will hold the country together and prevent its destruction by the liberators turned tribal kleptocrats. Lives At Stake comes in a volume of 600 pages of narratives, inundated with many stories by many of the actors who played a part in the act, in weaving together what became the unique story of SPLM/A, their friends and partners in NPA and USAID, the crucial roles they played in the liberation struggle, and the journey through the early 1980s to the Comprehensive Peace Agreement in 2005 and afterwards reaching the promise land but then only to give it away. The book depicts how the liberation struggle which held so much promise, quickly morphed into a disappointing moral decay, the subsequent collapse of the SPLM from that decay and with it, in the author’s view, the unthinkable destruction of the state of South Sudan by none other than those same leaders who fought for its liberation. Whose lives are at stake? The book makes no room for ambiguity; the Sudanese state and successive Arab and Islamic centric governments in Khartoum since 1956 took turns to put the lives of the African people who live there and in South Sudan at stake. The state repression and violation of their human rights and dignity was systemic. The new state that just emerged with great expectations in South Sudan to negate the former’s vices is unfortunately no different; on the contrary it’s equally (unexpectedly) repressive and destructive to the people who live there. A repressive state begetting another of its kind, resulting in two countries with same repressive, autocratic and dictatorial system, one in Khartoum and another hatched in Juba by kleptocrats. The aptly named, so called “the two Sudans” are one and same kind dictatorship. Such is the conundrum that, the book contended, has now befallen the very people whose lives are at stake with little or no change in suffering under an oppressive regime of their own. After putting in a decent struggle, the end product and result is the same as the one before it for the people in the two Sudans living under dictatorships. The author, Halle Hanssen, who chronicled political developments in our turbulent continent for many years as the African foreign news reporter and correspondent for Norwegian Broadcasting Corporation in Nairobi, was not just well placed but also well connected with the liberation struggle leaders on one hand, and Norway Labour Party political leaders on the other. It’s nowhere possible to have a more credible source for the stories that inundated the book than the eye of the reporter. And who later took on the powerful position of Norwegian People’s Aid (NPA) Secretary General in 1992, with decisions for political solidarity and humanitarian support for the people whose lives are at stake in Sudan and their liberation struggle against systemic oppression by successive Khartoum regimes. The critical role that was played by NPA on the ground, in support for the people behind the frontlines in the liberation struggle was an embodiment of decisions of NPA solidarity with the oppressed, not just in South Sudan, but throughout the continent. NPA’s solidarity with the people whose lives were at risk was realized and embodied in projects to build NPA hospital and medical training facility in Chukudum, in Yei, and Akot. This is beside the delivery of food aid and supplies to relief thousands at risk when hunger and starvation struck periodically in many parts of South Sudan over the years. The menace of bombings by Khartoum was constant, Yei hospital and Chukudum did not escape Antonov bombing raids and many lives lost. The stories are varied and countless, replete with heroic actions, and risk taking while NPA remained undeterred by immense challenges to stand with the liberation struggle through thick and thin until the CPA was signed in 2005. It’s inconceivable that Norwegian Government Leaders, and later the US Congressmen who followed in their foot steps would have made successful fact finding field missions into South Sudan and Nuba mountains in the vast SPLA controlled territories without the facilitation and services of NPA on the ground and also in the air to fly in food, medical supplies, or VIP visitors who trekked to South Sudan. Throughout NPA’s relief work on the ground, the freedom fighters were provided a lifeline, knowing that there was medical care available in the event that they were injured in the front lines and would be taken to hospital in Chukudum or Yei for treatment. The visitors on fact finding missions to the territories under SPLM/A control included the US Special Envoy for Sudan and South Sudan, Mr. John Danforth, Norway Minister for Development Cooperation and Human Rights, Hilde Frafjord Johnson, Dutch Minister for Development Cooperation Jan Pronk, Executive Director of US Committee on Refugees Roger Winter and later Assistant USAID Administrator, the world-famous Brazilian photographer Sebastiao Salgado, amongst other celebrities. The stories are not also without a lighter and humorous ring to them. One such enduring story is that of John Garang’s satellite phone and payment of its bills, which ran into millions of Norwegian Krona (NOK) at expense of the Norwegian Ministry of Foreign Affairs (NMFA). At one point, John Garang’s phone was cut for unpaid bills, and was barred from making further calls before nearly a 600,000 NOK bill was paid, which was well beyond the cost of a few calls to Oslo. This cut or disconnection occurred in the middle of a developing battle in the SPLA front lines, which left the SPLA C-in-C furious and without communication to coordinate the battle and give instructions to commanders in the middle of a large military battlefield and operations as Garang protested! So NPA had to “pay the bill as fast as possible”, considering the C-in-C was sure that the other party “NMFA” was the party responsible for settling the bills but broke its promise. The story had it that the phone could only be used in connection with peace negotiations, and the NMFA reserved the right to turn it on and off, to which SPLM agreed. While otherwise usage by John Garang was not part of the terms and conditions of the agreement for the phone, still NPA and NMFA had to be creative in settlement of the phone bills running into a few (3 to 5) millions NOK, in solidarity and support for the struggle of the people whose lives are at stake. The enduring rebel was able to carry on using the sat phone unperturbed, and out with the terms and conditions, with airtime cost still paid for at NMFA expense, or times at NPA’s expense. In theory, the satellite phone was intended only for communication with NMFA contacts in Norway for bilateral consultations related to peace negotiation initiative. NMFA needed to consult with John Garang in the field on urgent issues or developments, there was no other means to reach him without a satellite phone paid for by NMFA, which ended up being used as a modern day Facebook and essential tool of the C-in-C for field work as well as connectivity with the outside world. The SPLM/A and its struggle is hugely indebted to the people of Norway and NPA in particular, who were and still are the true friends of the peoples whose Lives are At Stake. Paradoxically now lives are at stake from the systemic corruption, oppression and kleptocratic rule of Salva Kiir’s regime in Juba. The book is very scathing about the introduction of what the author described as Kiir’s regime fundamentally undemocratic security laws that were approved by the Parliament in 2014, that gave notorious security operatives in Kiir’s government a free hand to continue a murderous business in Juba and South Sudan. This has cast dark clouds over the new state, and the president is held responsible for the dangerous spiral of death that is destroying the state of South Sudan. The infamous Marial Nour Jok, a notorious security operative in Kiir’s government merited a special appearance in the narrative, for his part in the 2013 massacre of ethnic Nuers, with approval of the President, and many other disappearances and gross human rights abuses committed by Marial Jok in Juba and during the liberation struggle, including ordering execution of three catholic nuns in a school in Akot accused to be spies, and who narrowly escaped death at his hands when another commander was quickly dispatched (after an alert was raised) together with Dan Eiffe to rescue the catholic nuns from execution the following morning. Marial Nour Jok had dug holes in the ground for the three to stay over night with only their heads left out for air awaiting their fate the following morning. Had the execution of the nuns gone ahead, SPLM and the entire liberation struggle could have been in tatters from the resulting condemnation of Marial Nour Jok’s barbarism and unfettered brutality, which has continued to rear its ugly head under the brutal regime of Salva Kiir. It is only in Kiir’s government that operatives with such brutal record as Marial are not banished, but given a free hand to operate outside of the rule of law and rewarded for their unrestrained, unfettered and inconceivable impunity. It’s not like there were no genuine efforts between 2005–2013 to develop democratic institutions, the author noted. The NCP’s dictatorial Islamic state that came to power in the 1989 coup ’de tat was not made for democratic reforms in the country when it enacted the oppressive Press and Publications Act 2004, into law just before the CPA was signed in 2005. The needed reforms to create the legal and professional base for freedom of expression and independent media in the two Sudans, which was non-existent, met with resistance and sabotage by highly placed people in NCP, and also most surprisingly by highly placed people in SPLM and Government of South Sudan. The author was at pains to explain how this happened and why. The Consortium for Freedom of Expression and Democratic Media Legislation in Sudan was conceived after many prior consultations with SPLM Leadership and civil society groups both local and international, as a project to assist efforts of democratic transformation in the “two Sudans”, particularly so in the new democracy that was promising to emerge in South Sudan, anticipated by the author to be the “showcase counterpart to the dictatorship” of NCP in the other Sudan. The close relation between the Consortium and Government of South Sudan leadership, which was fostered by the late Dr. Samson Kwaje, the Minister of Information & Broadcasting since 2005, was suddenly hit by “some chilly head wind in 2008”; when Kwaje was moved from his post by the President to become the Minister of Agriculture. Mr. Gabriel Changson Chang from UDSF  was his replacement to carry SPLM flagship democratic transformation policy in Government, which foundation was laid by Dr. Kwaje in the media policy passed by the SSLA in 2007 and adopted by the Government for subsequent media legislation six years later on in 2013, instead of the original six months schedule planned by the outgoing Dr. Kwaje to enact democratic media laws in South Sudan. In the mean time, as a University colleague Lako Logali, the then senior legal advisor in the Justice Ministry stated in a meeting on the status quo, the Press and Publication 2004 Laws adopted by NCP before the CPA, were still valid and applicable in South Sudan until the Assembly passed new laws. The SPLM leadership and President Salva Kiir was neither in a hurry nor in great haste to enact any new democratic media laws. They were comfortable with either, the status quo NCP press laws 2004, or operating without laws after 22 years of liberation struggle for freedom and democracy, liberty, justice and equality. Mr. Lako Logali technically speaking, was somewhat right that as long as new media bills were not passed, the NCP laws from 2004 were still the only valid laws in force. Those too were the views of some key SPLM members in Kiir’s government. There was therefore need to prioritize the enactment of new media bills in South Sudan, and AMDISS pressed the Government for this in 2009 with draft media legislation bills; the Right to Information, Public Service Broadcaster, Independent Broadcasting Authority and Media Self-regulation. The author of this book review was at the time AMDISS Secretary & Executive Director, who led media legislation advocacy in the Parliament, which he continued until the media bills were enacted by the National Legislative Assembly into Acts of Parliament in 2013, just before the 15th December 2013 debacle and crisis which triggered the first two years civil war 2013 – 2015. The leading critic of the democratic media legislation bills in SPLM and in the Government of South Sudan, was none other than Michael Makuei Lueth, who at one point and single-handedly as Justice Minister introduced amendments in the draft media bills with provisions for licensing journalists and media outlets in the country, and criminalizing defamation offenses. AMDISS has had to intervene with a strong letter of protest to President Salva Kiir for the unilateral actions of Justice Minister Lueth to introduce amendments in South Sudan media legislation of exact same provisions, which were in conformity with NCP’s 2004 press laws. A critique of Minister Lueth’s infamous amendments was published in Media Policy, Legislation and Legal Framework. This has helped reverse most of Minister Lueth’s inspired changes for repression of freedom of expression and media censorship in South Sudan. Later with the advent of the 5 years civil war since 2013, and with Michael Makuei Lueth in charge as Minister of Information & Broadcasting, the enemy of democracy is all too obvious. Under Lueth and President Kiir, it is no surprise that repression of democracy, the media and freedom of expression is rearing its ugly head and continuing in South Sudan. The opponents of democracy are succeeding, to maintain validity of the media laws in suspense indefinitely, and the NCP’s 2004 laws are the ones still in force in South Sudan in conformity with Lueth’s and Kiir’s wishes., exactly 13 years after the CPA was signed, and 7 years after South Sudan independence! The “two Sudans” are alike, and who would have thought that leaders of the liberation struggle in South would be united with NCP stalwarts in oppression and violation of basic human rights in their own country. Isaiah Abraham and many journalists paid the ultimate price with their own lives, victims of impunity and unknown gunmen of the ruling mafia in Juba. This deadly fate of the media climate was cultivated by Michael Makuei Lueth, who was anti democratic media bills in 2009, had failed to enact laws which license journalism and media, and which criminalize defamation. However, Lueth finally succeeded more than any other reactionary and autocratic SPLM politician to making the media laws dead and lifeless statutes in today’s Jieng Council of Elders governed South Sudan. There is no denying, the author contended, that Dr. John Garang had an impressive gravitas of academic and military credentials, which helped steer the SPLM/A ship through turbulent times. The ship, when it lost its captain who gave it direction, nonetheless had all the resources and more opportunities at its disposal to manage and sail through the local storms, which were self inflicted from 2005 to 2013. The ship lost party and institution building opportunities from its legacy of 1994 Chukudum and second 2008 Juba conventions. It was approaching shores of the new emerging democracy in Africa in 2011 with an interim constitution that is needlessly cultivating early in the new democracy authoritarian and dictatorial powers in the hands of the President. The opportunities were lost to lay a foundation for economic recovery and development policy and with that the political will for democratic transformation ended and turned tribal and primitive. The Dura saga, plunder of national coffers, stolen billions by the list of 75 SPLM senior government officials, endless impunity in the emergent South Sudan, have all conspired to break up SPLM and with it the country’s destruction, presided over by war lords and kleptocrats, and for that the responsibility lay with Salva Kiir and his insider circle of confidants, tribesmen and women. “ if nothing was done by the International Community to take measures that would deescalate the SPLM conflict, South Sudan could be thrown into violent conflict and war again”. In October 2013 as a mediator invited by the President, the author Halle Hanssen and Salva Kiir between them had 22 years of friendship since they first met in 1992. It was thus paradoxical the mediation had failed at a critical time, with disastrous consequences for the country. The responsibility for mediation failure, Mr. Hanssen contended, lay with President Kiir and the inner circle surrounding and advising him in Juba. Salva had already recruited and trained 3,000 Mathiang Anyoor Dinka militia from his state of Warrap, and attached them to Presidential Guards in Juba ready for a show down with Riek and the Nuers. The clock was running down to explode the myth of SPLM and it did. The book recalls the open letter to President Salva Kiir in June 2013, authored by the renowned American friends of the liberation struggle, John Prendergast, prolific writer on Sudan and South Sudan Prof. Eric Reeves, Roger Winter and Senator Ted Dagne, warning against a collapse of democracy under authoritarian leadership of the President, large scale corruption and violations of human rights. South Africa, and Ethiopia who also dispatched their emissaries to Juba to avert the developing internal conflict, met with indifference and tribal intransigence. It all ended in President Kiir unleashing a private military militia on Nuer civilians. It’s now this militia that is keeping Kiir in power at all cost. Thabo Mbeki, the former South Africa’s President described the ruling SPLM in Juba as a bunch of kleptocratic tribalists. The Trump administration further indicted President Salva Kiir’s leadership as being “morally bankrupt”. The scathing conclusion of the book is no different. Since the summer of 2013, the SPLM has long ceased to be the leading democratic and progressive political organization in the country, not capable to lead democratic transformation after independence in 2011. President Salva Kiir has literally installed himself as a full time dictator and earned condemnation of world leaders and friends of South Sudan liberation struggle alike; for the abject conditions of human rights abuses, corruption and impunity he created and permitted in the country on his watch. SPLM is without legitimacy, fractured and failed on all counts, and is now without institutional foundations to retain the trust of the people after its leaders massive corruption in Government, which ultimately triggered and imposed a civil war in SPLM and equally in the country. This is occurring whilst the family of the President and relatives and children enjoyed “La Dolce Vita”, owned expensive villas, owned shares and a string of businesses of all trades, and looted public resources with impunity, such as Bol Mel’s infamous ABMC business model. There is therefore absence and lack of any political will or capacity left in the ruling SPLM, and in this dictatorship and kleptocracy to be the one entrusted with developing genuine democracy and peace in the country when credible democratic institutions are non-existent in all SPLM variants of the IG, FDs or IO kind. That said, the country is now faced with a huge deficit of democracy and peace development, which puts the people and respect for their dignity and basic human rights first. The burden of democracy development lay not in the SPLM variants of corrupt-elites power sharing governments of the R-ARCSS type or that before it. That burden of democracy and sustainable peace development laid with a radical approach in a future ‘all peoples national alliance for democracy and freedom action’ alternative government, one that shares power equally between the peoples of Equatoria-Upper Nile-Bahr al Ghazal inclusively in all their diverse 64 ethnicities. The alternative is the Peoples NADAFA Government for the country, and that is what’s now most needed to clean the country from endemic corruption, end impunity and kleptocratic rule of SPLM and Salva Kiir that has destroyed the social fabric in South Sudan. The people’s NADAFA government will mend and repair the social fabric, establish the new social contract that puts the people and their human rights first. Dan Eiffe was NPA coordinator in the field, an Irish catholic priest who played a critical role liaising between NPA and President Museveni when SPLM/A faced defeat by the NIF and allied militia forces at Aswua bridge battles in 1992. He played a vital media relations role for NPA and gave witness statements in USA congress in support of the liberation struggle in South Sudan. Later as publisher of Sudan Mirror, he was also a founding member of the Association for Media Development in South Sudan (AMDISS) with great dedication. Access to Information Act 2013, South Sudan Broadcasting Corporation Act 2013, Media Authority Act 2013, passed in June, August and September 2013. Led by Chair of Parliamentary Committee for Information, Telecommunications and Culture, Hon. Joy Kwaje MP. Thank you Dr Dario for the great book review.